Have you ever looked in the mirror and wished your smile were more aligned? With the orthodontic options offered at Smile Creation, you can get the look you want. Whether your teeth are gapped, crooked or your bite is misaligned, we can help. 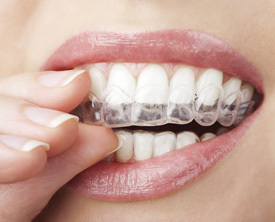 Using clear aligners much like Invisalign®, ClearCorrect devices straighten your teeth invisibly. No metal “train tracks” are necessary to get the smile you want. They’re also removable, so you can take them out at meal times. Dentist Dr Sanjay Khanna is a provider for ClearCorrect and is well-versed in helping people achieve their desired results with this option. The process involves a system of custom-created aligners that are switched out at regular intervals, slowly shifting your teeth into the proper position. All brackets and wires will blend in perfectly with your existing teeth, so there is no self-consciousness during your brief treatment time. Classic metal braces are still often chosen as a go-to way to straighten teeth. They’re suitable for all ages and can correct a variety of dental issues. We’d be happy to meet with you and discuss which option is most suitable for you. !